“Great service is something we are all passionate about, along with bringing excellence back to the (hotel) industry,” said Peter Anadranistakis, Oxygen Hospitality Group president and former president of Caliber – The Wealth Development Company. Phoenix-based Oxygen Hospitality Group – a real estate investment and management company – was co-founded by Anadranistakis; Merv Chia, company chairman as well as president of NEX Industries Corp. and CEO of NEX Technology Capital in Winnipeg, Canada; and Yaron Ashkenazi, company CEO and a top European hotelier. The three say guest service is their top priority. “When they are checking out, we want them to already be thinking of returning and possibly booking their next stay,” Anadranistakis said. Oxygen Hospitality officially became new owner of Ivy Palm on May 24. A sculpture at the Ivy Palm Resort and Spa in Palm Springs which is under new ownership, May 30, 2018. 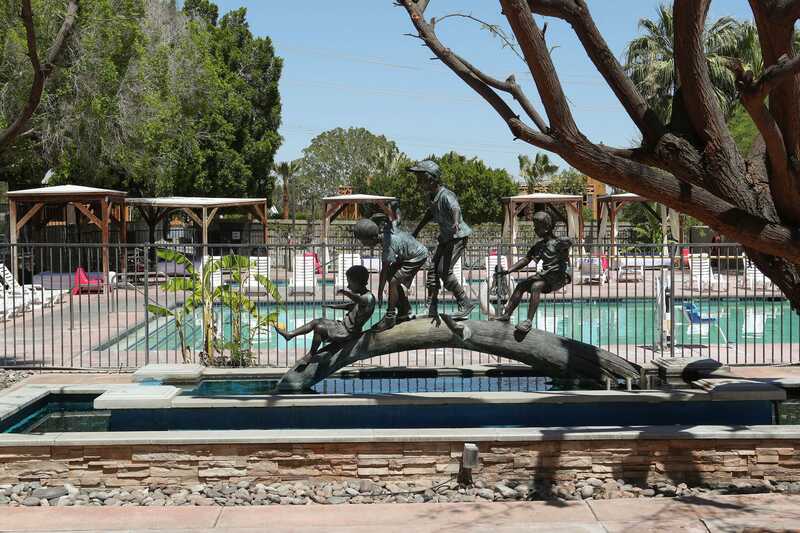 Built in 1982, the four-building, two-story hotel sits on about three acres at 2000 N. Palm Canyon Drive. It was built in 1982. It was last renovated in 2006. Improvements will be done in two phases and take about two years to complete. They have contracted with Irvine-based MDR Architects Inc.
“First, is bringing this property to life,” Ashkenazi said. A former restaurant area will become the new lobby, giving arriving guests an immediate view of the resort’s two swimming pools, hot tubs and surrounding greenery. The lobby will consist of a bar and “a barman will give guests their room key,” said Ashkenazi. A breakfast area and coffee shop will be situated off the lobby, “offering the best coffee and breakfast in Palm Springs,” he said. TOURISM: Visitors in 2017 spent over $5.5B in the Coachella Valley. Here’s how tourism managed to rebound from the recession. 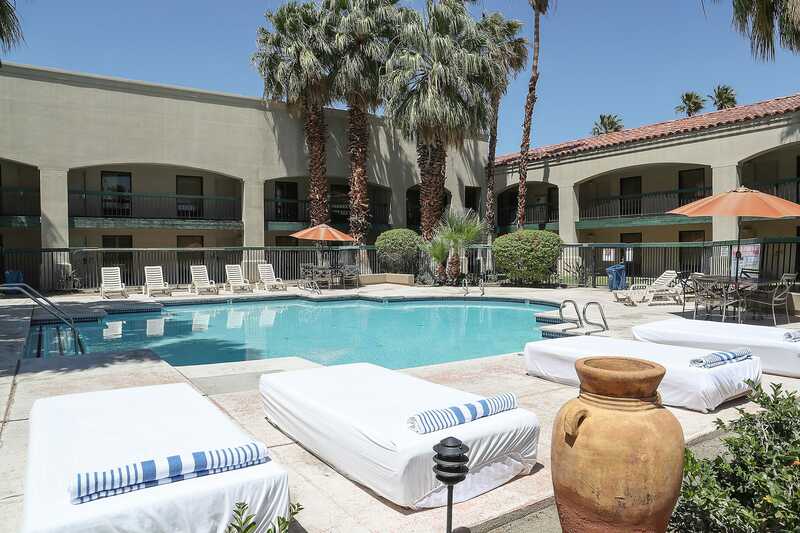 The Ivy Palm Resort and Spa in Palm Springs is under new ownership, May 30, 2018. Phase one also will include the makeover of six rooms or suites situated over the new lobby area. Renovation of the remaining 94 rooms will be part of the second phase and include technology upgrades. “We will have first-class technology systems,” Ashkenazi said. The property’s new general manager, Chadwick Bauer, has been in the valley for several years and comes to Ivy Palm from Wyndham Vacation Ownership in Cathedral City. “The Ivy Palm Resort & Spa is a perfect canvas to showcase how we plan to differentiate our brand of hotel ownership and operational management in markets that exhibit strong growth,” Ashkenazi said. “The hotel’s layout and structure have all the redevelopment potential required to bring it back to profitability and into an exceptionally modern and upscale boutique property certain to be popular to U.S. and global tourists alike,” he said.